Today I joined my first knitalong for the most beautiful sweater hosted by Julsey at Peony Knits. It is sweater number 20 from the Phildar Tendances Sutomne 05/06 book. I ordered my pattern book and yarn from Knit N Tyme and am in the process of translating while I wait for my yarn. 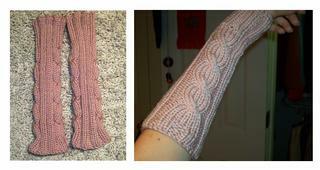 I also started a pair of Broadstreet fingered mittens for my dad for Christmas. I am knitting them in Blue Sky Alpacas 100% Alpaca Sportweight, the most wonderful yarn in the world. So soft and warm and very light. Yum. 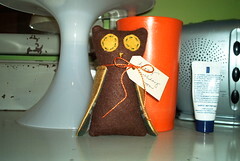 One owl made for a friend's birthday. 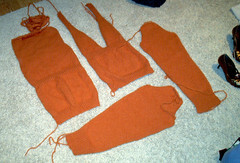 4 pieces of the Hooded Pullover (#32) from Vogue Knitting Fall 05. 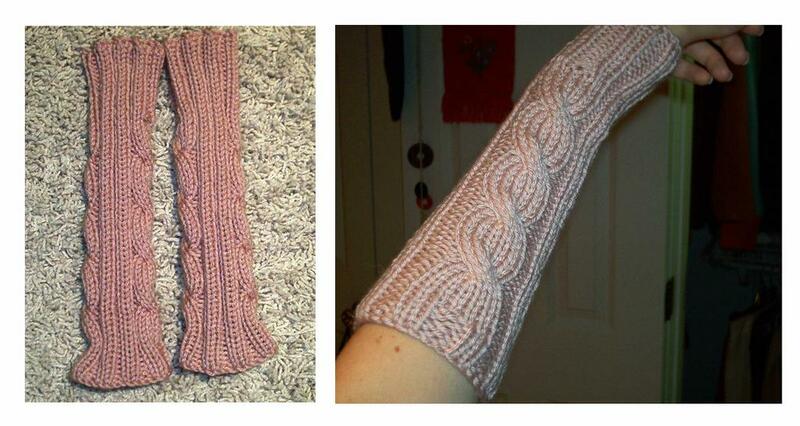 One pair of armwarmers knit in Debbie Bliss Cashmerino Aran in dusty pink or something like that for my sister, an uber-quick knit. I didn't know how she would feel about the cables so I put them on the sides in case she thought they were a bit odd. Pretty hard taking a picture of your own arm.